Linzer Cookies are Austria's most famous dessert. Traditionally the cookies are made with almond flour, and the cookies are sandwiched together with a layer of jelly or jam. The top cookie is dusted with powered sugar and has a cutout so the jam, typically raspberry, is visible making them very decadent. Linzer Christmas Cookies are an embellished version of the real thing. 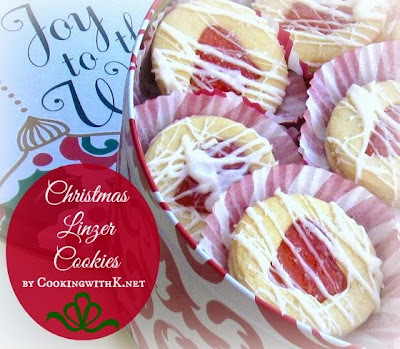 I make mine from my favorite sugar cookie recipe, sandwich them with seedless jam, and embellish them with drizzled white chocolate and sprinkles of coarse sugar, which makes them irresistible. Preheat oven according to sugar cookie recipe. Roll out sugar cookie dough 1/4 inch deep. 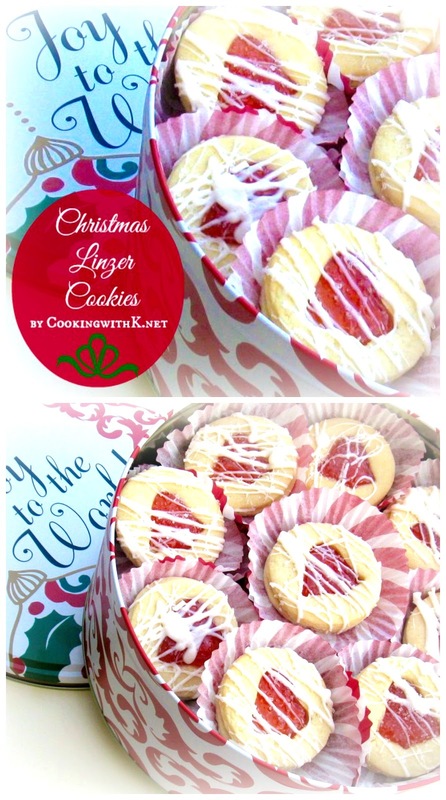 Using desired cookie cutters, cut 1/2 of the recipe into desired shape and and bake. Cool on a rack until ready to assemble. Using the same cookie cutter, cutout the remainder of the dough. Using the same design, cut a center design out with a cookie cutter that is twice as small and bake. Cool on a cooling rack until ready to assemble. To assemble, spread a small amount of jam in the center of the cookie and lay the cookie that has the center cutout on top of the jam. When all the cookies have been assembled, place all of them in three rows on wax paper and drizzle melted white chocolate over the cookies. Immediately sprinkle the coarse sugar; let set until the chocolate has hardened. You might see this recipe on Weekend Potluck, and all these fabulous parties! These look absolutely delightful and festive, Kay! Pray you will have a blessed and beautiful December. What a wonderful cookie to add to a cookie tray...they look so sweet and festive! 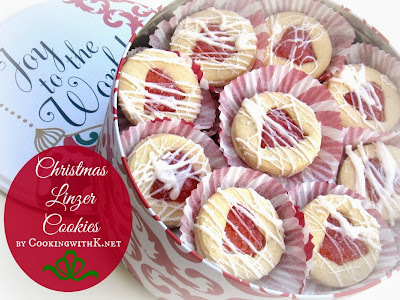 I have always loved linzer cookies - I think they look so beautiful and I just love their flavour. Thank you for sharing this post with the Hearth and Soul hop. Beautiful and I'm sure delicious! Thank you for joining me at Home Sweet Home! sugar cookies are love. though I haven't tried the freshly baked ones. I only buy it prepared from the grocery. These are beautiful! I love the white chocolate garnish, thanks for sharing with the Hearth and Soul hop. These look yummy and so festive! Thanks for linking up with me last week for Friday Favorites. I'm featuring you in this week's special Holly Bloggy Christmas Edition!